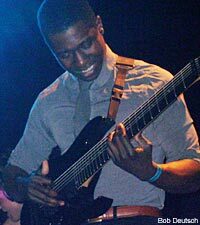 Howard Stern and Jennifer Aniston may be the most famous practitioners of Transcendental Meditation, but Animals as Leaders guitar hero Tosin Abasi also swears by it. "You are supposed to do it twice a day, in the morning or before dinner, but I don't always get to do it twice since I don't have a structured life right now being on tour," Abasi told Noisecreep. "But I am glad I learned the technique." He picked it up during high school, when he visited a friend's dwelling and saw a picture of Maharishi Mahesh Yogi, the person responsible for bringing TM to the West. "I asked, 'Who is that? Your guru?' as a joke and my friend was like, 'Yeah!' His family is like a second family to me, and they gave me books about it and it totally open the door for me." Abasi said that TM offers multiple physical and physiological benefits. He said, "It can reduce stress, lower your blood pressure and if you are well-rested, you can do anything 100 percent." But the process also affects practitioners on a much more profound spiritual and mental level. "It aligns you with deeper portions of your consciousness," he admitted. "As a creative being, who knows where creativity comes from? It's good to know yourself on a deeper level, beyond intellectual and beyond thinking, and to experience your non-physical." The guitarist thinks that practicing TM affects his playing -- in the best possible way. "I have my best shows if I meditate directly beforehand," Abasi said. "When it comes to playing guitar, I am utilizing my body to achieve speed and accuracy, so meditation achieves focus."